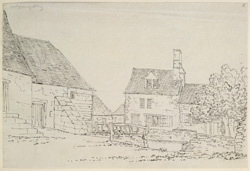 An outline view in ink of part Osney Abbey's Mill, near Oxford, drawn by S.H. Grimm. The Abbey was founded in 1129 by Robert Doyly the younger as a house for Augustinian Canons and it lay in a water meadow to the west of Oxford. In the 13th century, it it thought that monks from Osney Abbey built a new stream channelling the Thames to power their mill. The abbey was dissolved in 1539 and its building were briefly used as the centre of the new diocese of Oxford. However in 1545, it was moved to Christ Church, which also took over the local estates of the former abbey. Today there is very few traces of Osney Abbey left.